All this time, I've been thinking NaN is not a number. What an idiot I've been. And yet of course, NaN == NaN is false. There you go. Amaze your friends. I only recently stumbled across what's got to be the most outlandish scripting hack I've seen in a long time. Jacob Seidelin tells of how he managed to stuff text into a PNG image, then get it back out with the <canvas> getImageData( ) method. What's neat about it? Mainly the free compression you get with the PNG format. For example, when Jacob put the 124kb Prototype library into PNG format, it shrunk to 30kb. 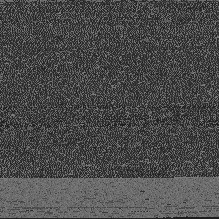 Of course, it makes for an awful-looking image (see above), which one might think of as a degenerate case of steganography, i.e. embedded data in an image, minus the image. The trick doesn't work for all browsers, since you need canvas for it to work. And it's kind of pointless given that you can use gzip instead. But it's kind of neat in that it opens the door to browser steganography, embedding of private metadata, and potentially lots of other cool things. Finally I gave up on the online schlockware and went straight to Flexbuilder (which has been sitting unused on my desktop), and I thought "Surely this will do the trick." Imagine the look of abject horror on my face when I found that the ActionScript editor could not do the equivalent of Control-Shift-F (for Java in Eclipse). In fact, the formatter built into Flexbuilder's ActionScript editor won't even do auto-indenting: You have to manually grab blocks of code and do the old shift-right/shift-left indent/outdent thing by hand, over and over and over again, throughout your code, until the little beads of blood begin to form on your forehead. Is it just me or does anyone else find Firebug+FF3 on Vista to be flaky? It loses my console code if I switch tabs (not windows, just going to another tab and coming back). Sometimes the FB console stops working or won't execute "console.log( )". And it seems as though weird bugs show up in the Firefox console that don't show up in the Firebug log pane, and vice versa. Also, I don't appreciate having to manually turn on the console for every web domain I go to. What a PITA. I wonder if that behavior can be disabled somehow? Right now, I'm feeling disabled. I took this code verbatim from a web page in which the author of it claims (ironically) that it's an incredibly fast routine! In testing, I found the shorter routine faster by 50% on very small strings with very few leading or trailing spaces, and faster by 300% or more on strings of length ~150 with ten to twenty leading or trailing spaces. This is an important point. Interpreters are written in C++ (Spidermonkey) or Java (Rhino). The built-in functions of the ECMAScript language are implemented in C++ in your browser. Harness that power! Use the built-in functions of the language. Never hand-parse strings with "indexOf" inside for-loops (etc.) when you can use native methods that run at compiled speed. Why walk if you can ride the bullet train? 1. In FF3, go to Organize Bookmarks and export your bookmarks as HTML so you don't foolishly lose them. 3. Launch Firefox with a command line of "firefox -profilemanager". 4. When the profile manager dialog appears, create a new profile. 5. When FF launches, install Greasemonkey. 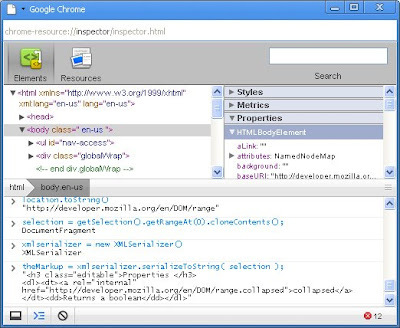 How to use JS 1.7 in Greasemonkey? That's not what I need. I need to turn it on in Greasemonkey's execution context. Others have run into this problem. It appears, however, that the Greasemonkey guys won't do anything about it. I was hoping there'd be some clever back-door way to do this, but that seems unlikely. There appears, alas, to be no workaround, short of the usual (for Greasemonkey) expedient of vulturing the unsafeWindow, which is of course repulsive and unacceptable. If anyone knows of a non-ugly solution to this problem (the problem of how to use 'yield' in Greasemonkey scripts), please advise. I've learned some interesting things about the way selections work in Mozilla. Every window has a singleton selection object, even when the user has selected no items on the rendered page. Therefore, window.getSelection( ) always succeeds. There is a "rangeCount" property on the Range object, so that you can know how many Ranges were selected by the user. In Firefox 2.0 and prior, the rangeCount was never more than one. But in Firefox 3, the user can do multi-selection of page contents. (Try it: Hold the Control key down as you swipe across various pieces of a page.) That means the range count can be more than one. This is all spelled out at the Moz Developer Center page on Ranges. But I quickly ran into a small problem. (And just as quickly, the solution.) Allow me to explain. The problem: I want to search for nodes in the repository that have a (multivalued) "pets" attribute containing the value "dog." Note that the "pets" attribute might have multiple values. I want to filter against just one. Therefore I can't do an equality test. I must use the XPath contains() function. This produced an InvalidQueryException, with a message of "Unsupported function: contains (500)". I was a bit surprised that the servlet seemed to know nothing about any contains() function. A true "WTF moment." I'm so much of an XPath newb that I don't even know if I should have been surprised by this, but it did stymie me briefly. Anyway, it works now and I'm thrilled to be able to do XPath queries right from the GET-go. As a browser, this thing is not terribly impressive, from what I can tell. In any case, Chrome itself strikes me as too fugly to deal with. I'm not sure which I'd rather do: spend a work-day using Chrome as my main browser, or jam prickly-pears into both my eyes at once. I think I'll stay with Firefox until Chrome gets out of beta. Which (if it's like Gmail) it never will.